The Orin framed cubicle system is a proven standard for childrens washroom cubicles, providing schools and nurseries with a fun and hygienic washroom solution. 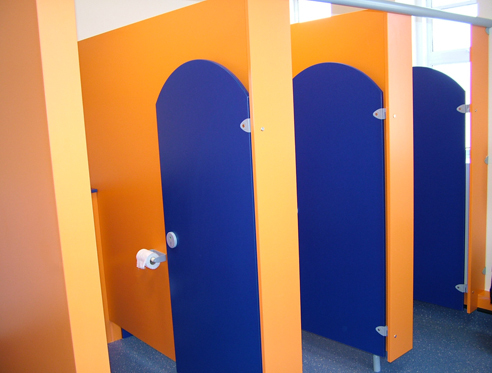 The arched tops to the doors and shaped partitions create a washroom environment that is imaginative whilst providing the necessary requirements for supervisory care. With four door height options and three performance levels, the Orin flexible system can be specified for any installation. The Oliveti Cubicles team has covered all aspects of safety and thus included are safety hinges to avoid the risk of trapped fingers, and indicator bolts with built in emergency release mechanism offer peace of mind. Bright powder coated coloured fittings and fixings. Easy to operate emergency release mechanism. Anti-finger trap hinges for children. All hinges include fall closed, open or ajar cammed door hinges. A range of suitable bench seating available. The red and blue Orin hinge is strong, reliable and incorporates a single blue fixing through the fascia. The hinge has an anti finger trap design to prevent curious children injuring themselves and it is easy to fix and does not require factory pre-drilling. Any headrail gives added strength to cubicles, and this commonly chosen design in a matching blue finish provides more than ample strength for children's cubicles. Bright yellow coat hook, supplied with fixings and a rubber buffer to prevent damage to walls and partitions.